Central to this discussion of facts and trust was the almighty Google. The session presenters said several times that the top results from Google searches were untrustworthy. This assertion led to some really whacky and (I think) unworkable ideas, like regulating information on Google and little badges to certify trusted bloggers. An interesting discussion ensued. Are Google searches really skewed towards misinformation? One presenter described searching for information on vaccines and finding most of the top results were sites with misleading information. Later on, I heard her and one other presenter say something that I knew was incorrect. (I really don't blame them for this, but we'll get to that later.) So, I had to do the experiment. 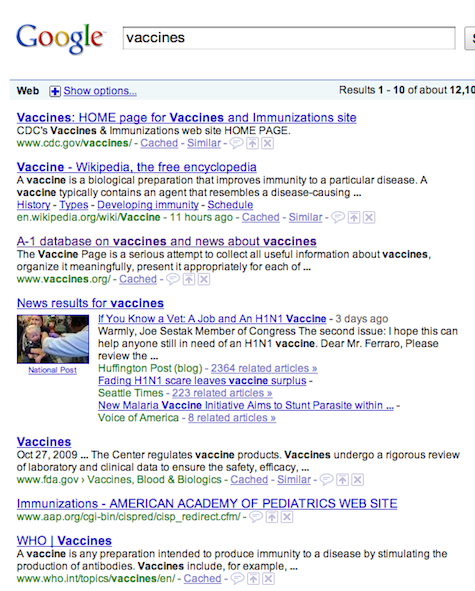 When I got a home, I did a Google search myself using the word "vaccines"
. I didn't see any misleading sites until number 10 (it was too far down to see in the image), where I found something called the Vaccine website. The top sites were the CDC and Wikipedia. Good enough. Next we had A-1 database. That site is from PATH, a wonderful organization, based in Seattle, that I trust. Then, we have news results and pediatricians and the world health organization (WHO). Sure, I may have used a different search term than the presenter, but I certainly had a different result. What about going directly to reputable sites? One alternative to certifying bloggers (good luck with that!) 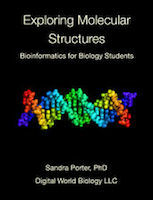 is to teach people how to evaluate information and maybe even give them some places where they can go directly to find information that's reliable. (I hear the Pacific Tree Octopus is endangered, better get on that!). Some people pointed out that there could be helpful people, maybe even professionals who could point people to reputable sites. Hmmm, that sounds familiar. Right! We call those people librarians! 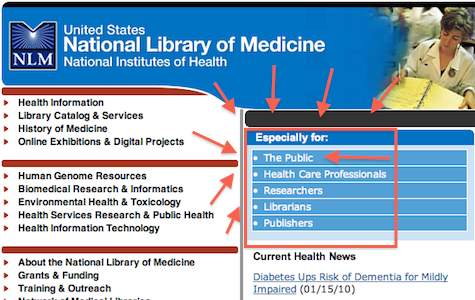 Maybe we need librarians on the web I suggested people might go the National Library of Medicine for health information. Two panelists told me that the NLM has nothing, nothing at all for the general public. Back to fact checking. Conclusion: Even those of us who might usually be right can sometimes be wrong. A badge seems like an easy way out but someone would figure out how to misuse it. I don't think there's any good substitute for teaching people how to check facts. Or perhaps, consult a librarian.